His tastes ran toward South Beach style – cool whites, bold colors, sunny and confident, with a hefty dose of nightlife magic in the mix. 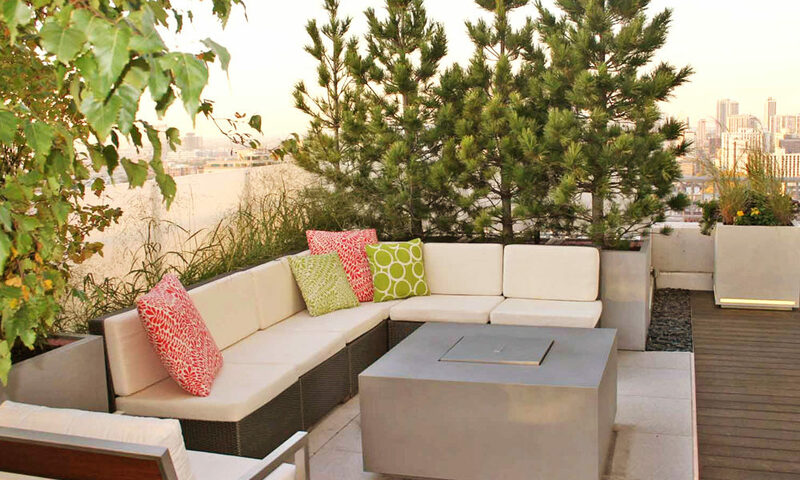 When we were approached by our interior design friends at JT Living to design and build the terrace for their new client, we jumped at the chance. 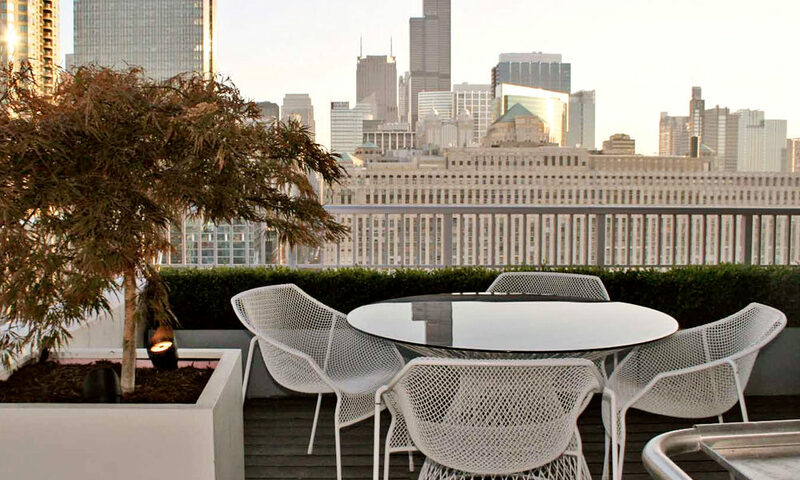 We’d already had experience with two other clients in this River North building, and knew the 24th story penthouse terrace would be a fun and challenging project. Indeed it was. His tastes ran toward South Beach style – cool whites, bold colors, sunny and confident, with a hefty dose of nightlife magic in the mix. 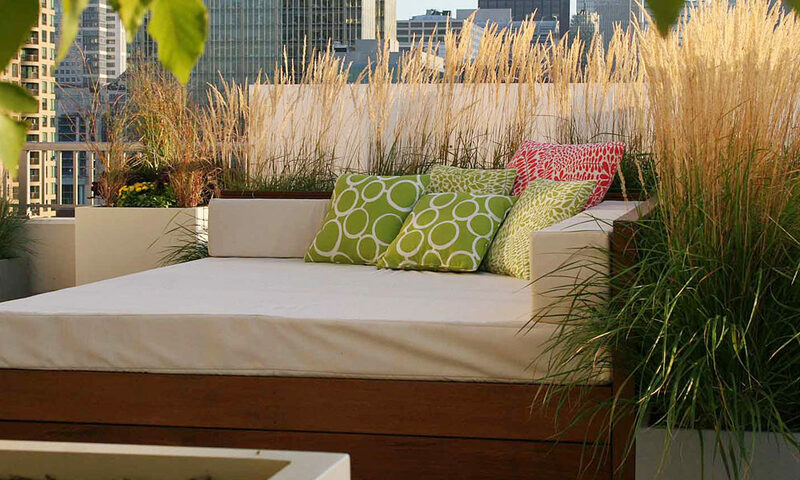 The open-floorplan, airy penthouse occupies the entire floor; the large main terrace wraps around 3 sides of the building, with two smaller terraces on outer corners. Our client wanted a hip, fun space to live in and to house his collection of pop culture paintings, posters, art and music. His tastes ran toward South Beach style – cool whites, bold colors, sunny and confident, with a hefty dose of nightlife magic in the mix. 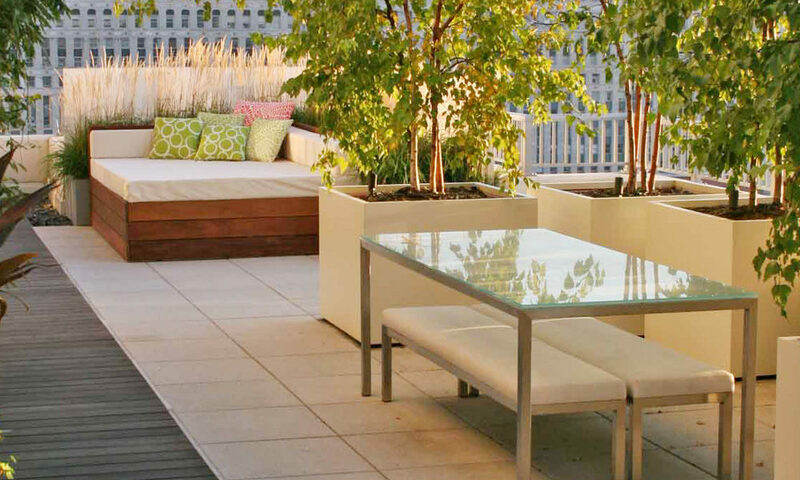 We started with an ipe boardwalk on the large terrace, multiple large Ore planters housing birch trees, native grasses and boxwood for a clean, simple, contemporary look which would add movement and withstand Chicago’s punishing winds, heat and cold. A custom fire element, also from Ore, provides warmth and a focal point on chilly evenings. Vertical “green screens” support flowering mandevilla, wisteria and honeysuckle vines. 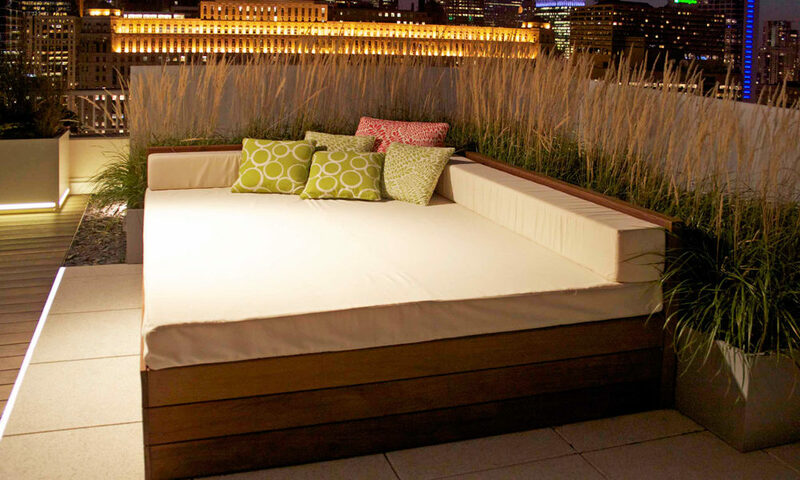 Landscape uplights, LED lightstrips in the decking and bollards bring the terraces to life in the evening. Two new planter boxes with built-in LED strips and bold tropical plantings were installed recently, and tap nicely into the Miami vibe.